I'm going to continue my Starburst Method series today, but first I'd like to say a few words about Hugh Howey's book Wool and why we write. If you'd like to skip to where I start talking about the Starburst Method scroll down to the heading "The Starburst Method, Continued". I started reading Wool yesterday and was amazed by the story. Hugh Howey's characters and events are emotionally compelling. The world of Wool is stark, filled with unpleasant realities, but the characters refuse to give up, they refuse to abandon their humanity. This collected work is dedicated to anyone who dares dream of a better place. When I read that something clicked for me. Wool is more than a book. It tells the story of a Silo and the people who live within its metal grip but, somehow, Hugh Howey has managed to do what all great authors have done since time immemorial, he has reached beyond himself, beyond his story, and connected with something universal. I'm bringing this up because I don't want to lose sight of this aspect of the craft. What I talk about in these essays—the questions I present ("What is your character's goal? "), the formulae—are meant to be intuition pumps, to help get us thinking in terms of story, they can't be the whole kit and caboodle. Okay, now let's continue on with our series. I wonder if "Starburst" doesn't give a misleading impression because instead of starting with something small and rapidly expanding we're starting with something big and nebulous—our relatively unfiltered and perhaps contradictory ideas for a story—then honing them. Perhaps this method is more like sculpting, cutting away parts that don't belong and adding ones that do. Today we're condensing our story down into five paragraphs. By the end, ideally, we will have reduced each paragraph to a single sentence. Each paragraph represents one stage of the hero's journey. 1.a. How is your hero DISTINCTIVE? Most stories take the hero out of the ordinary, mundane world and into a Special World, new and alien. This is the familiar "fish out of water" idea which has spawned countless films and TV Shows (... The Wizard of Oz, Witness, ... Trading Places, Beverly Hills Cop, etc.). Last time we started to get acquainted with our protagonist. Although we don't know everything yet we have an idea what he does for a living, his name, his special ability as well as his weakness, and so on. Here's another question: In the ordinary world, where your hero isn't perhaps very heroic, what is the most distinctive thing about him or her? Is he a troublemaker? If so, quickly write down an example, something that shows he's a troublemaker, a malcontent. Or perhaps your protagonist is much too much caught up in what society expects of him. Or maybe he is hopelessly in love with someone unattainable. In only a few words NB paints a clear picture of his hero. 1.b. How is your hero TRAGIC? That's the first part, setting your hero, your protagonist (I'm using those words interchangeably) as distinctive. Now we need to explain his uniqueness. There's another part to being a hero, the tragic bit. Many, perhaps most, heroes have something very wrong with their lives, some tragedy. This tragedy can perhaps help explain why he is distinctive in the way he is. For instance, if your hero is a thief perhaps it's because his parents died when he was a child and he had to raise himself on the streets. Jacob is a terror at school but we get the idea that's partly because of his dad's absence. That one sentence encapsulates, summarizes, gives us a snapshot of the hero's distinctive challenges and character. Everybody needs somebody, even heroes. Who are your protagonist's friends and helpers? What do they do for the hero? What are their weaknesses? In Lord of the Rings Pippin and Merry are troublemakers. They love eating (they could eat their weight in lembas!) and smoking 'leaf' and they nearly get Frodo killed more than once, but no one could fault heir bravery when a friend was in danger. He never would have survived without his best friend Dexter, even if he is a little timid, and his cute-but-tough friend Sarah Daisy, who is chronically overscheduled. Again, this paints a compelling picture. Tomorrow we'll continue this series and finish fleshing out our five paragraph summary. See you then! What are you writing about at the moment? What makes your protagonist distinctive? Does she have a tragic past? Who are her friends? What are her friends' weaknesses? What can her friends do well? 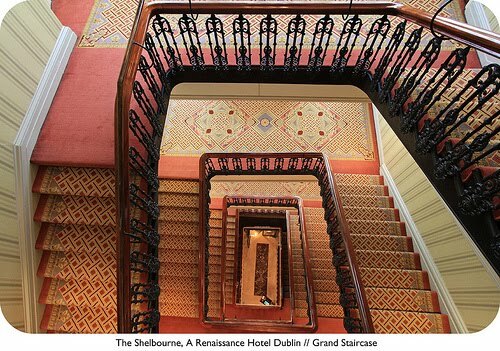 Photo credit: "Superlative Beauty // Footsteps of Happiness // Wonderful Moments // The Shelbourne, A Renaissance Hotel Dublin, Republic of Ireland // The Grand Staircase // ENJOY!" by || UggBoy♥UggGirl || PHOTO || WORLD || TRAVEL || under Creative Commons Attribution 2.0.